Dr. Lutz utilizes a patient-centered approach which incorporates his extensive training in chiropractic, rehabilitation and sports performance to quickly decrease shoulder pain, without the use of drugs or surgery. The shoulder joint is one of the more complicated joints of the body. It consists of the humeral head which sits on the glenoid fossa, much like a golf ball on a tee. This gives the shoulder its range of motion, but in return it can be very unstable. To combat this, the shoulder has 17 muscles that insert into it. These muscles and ligaments, when properly utilized, allow for smooth, controlled movements without any pain. Unfortunately, when shoulder muscles are not working properly one starts to experience pain. The most common causes of shoulder pain is from overuse, repetitive movements or poor posture (i.e., mechanical in nature). These can lead to pain in the shoulder girdle, upper arm, lower arm and even down to the hand. Shoulder pain is often described as achy, dull, sharp, numb and/or tingling and varies in intensity. The pain can range anywhere from minimal to debilitating. 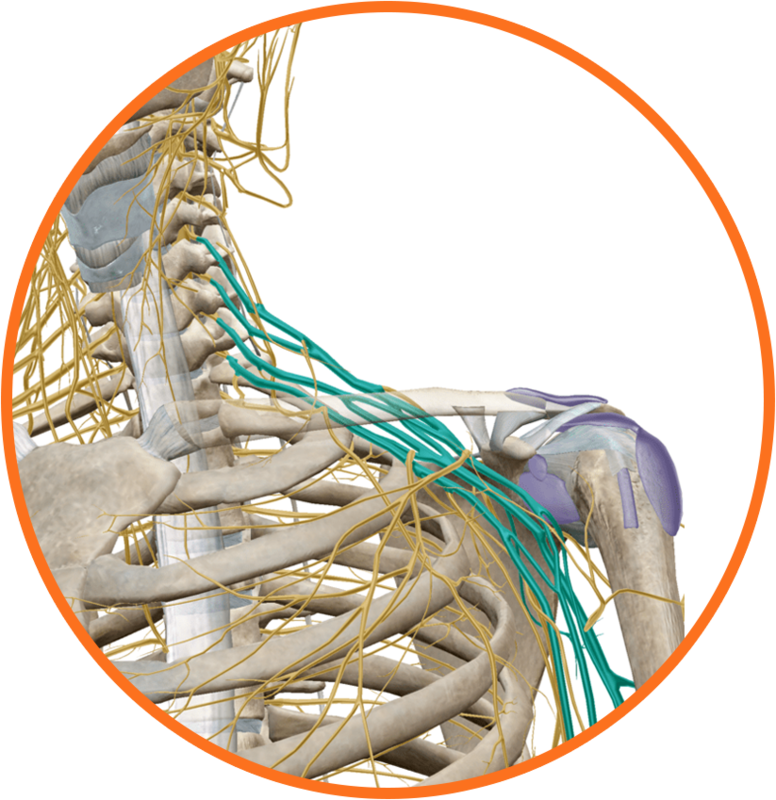 This is because the nerves that innervate the arm originate from your neck before coming together to make up the brachial plexus, a network of nerves in your shoulder area. These nerves then continue all the way down your arm to your fingers. Since the shoulder is made up of many nerves and muscles, there are many possible diagnoses for shoulder pain; such as, labral tear, rotator cuff tear, osteoarthritis of the shoulder, subacromial bursitis, bicipital tendonitis, and of course shoulder instability. However, not all shoulder pain is caused by these types of diagnoses. It could be something far less severe; such as, mechanical pain. Furthermore, even if ones’ shoulder pain is caused by these diagnoses, there are still many treatment options that will eliminate the need for prescription drugs and/or surgery. As you can see the shoulder is a very complicated joint and that is why it is so important to have a proper assessment to make sure you understand the pain generator. At Motion ChiroTherapy, you will be given a thorough medical history and physical examination to make sure you receive proper diagnosis and treatment. If we find you are a good candidate for conservative care (i.e. without the use of drugs, injections or surgery), we can begin treatment on your first visit. Treatment at Motion ChiroTherapy will always be in a 1-on-1 setting with the doctor for every visit. We will evaluate and reevaluate your unique symptoms and design a treatment plan to get you back to doing what you love, as quickly as possible. Remember, the most important step is to get your symptoms evaluated. At Motion ChiroTherapy, we provide patient-centered care. This means that if we cannot quickly reduce your shoulder pain, we will refer you to a specialist. Our goal at Motion ChiroTherapy is to be your musculoskeletal advocate and get you back to pain-free living, as quickly as possible. Here is a list of standard labels placed on patients, which we have successfully treated. To be clear, we do not correct tears and arthritis; however, there are times when patients enter our clinic with these diagnoses — call it “misdiagnosis” if you will — and we are able to fully rehabilitate patients that enter our clinic with these diagnoses. The problem with these diagnoses is they simply tell you what it is, not how or why it occurred or how to correct it. Furthermore, there’s no standard of diagnosis among professionals. If you suffered direct trauma to the shoulder, or experience dizziness, double vision, difficulty speaking/swallowing, or unexplained weight loss accompanied by shoulder pain, seek immediate medical attention.